It might be over 20 years since the release of Pokemon Red and Green but Pokemon enthusiasts are still making content for the iconic games. One player has created the most detailed original Kanto map to date. Pokemon's first video game was made for the original Game Boy and despite its ageing graphics, still retains a cult following. Pokemon Red and Blue are still played today and widely discussed in Pokemon communities. While Pokemon Green never officially made it to America or Europe, other versions of the Kanto region did hit the mainstream. Yellow and the Game Boy Advance games Fire Red and Leaf Green also became some of the most popular games of all time. 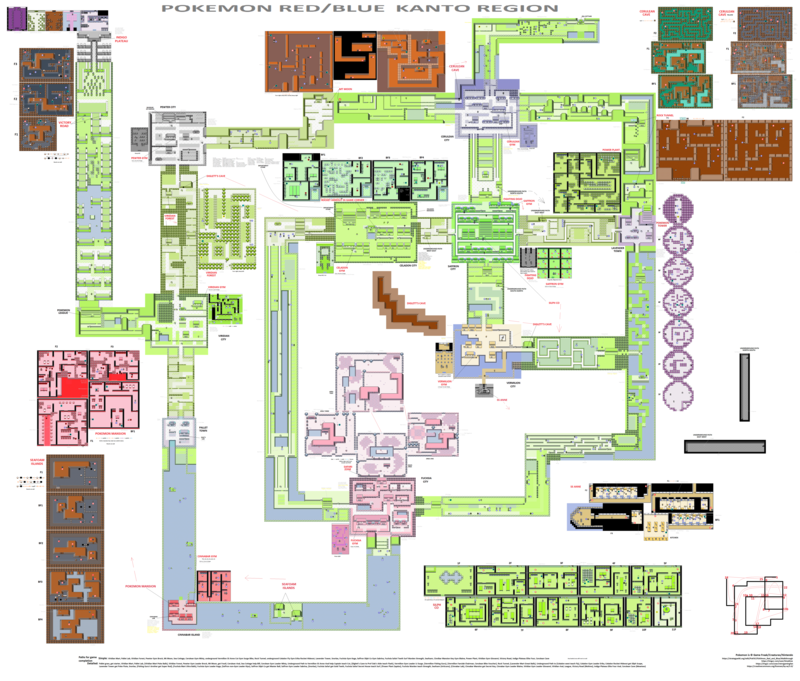 Reddit user, ZaidusRecon, has made possibly the most informative Pokemon map to date. They have taken the entirety of the Kanto region, not only including the whole map in one image but also the inside of key buildings, trainers to fight and all items. It is quite an astonishing feat considering the effort and patience needed to create something so meticulous. Zaidus said the task to them 32 hours to complete. Specifically Zaidus stated: "downloading Timeline's map, downloading the dungeons from StrategyWiki, adding the dungeons, using RetroGamingFan's map to correct Timeline's map, labelling the cities, gyms, and other locations, adding the directions and summaries, discovering further errors in the map, comparing the map to a manual playthrough of the game and correcting, then finally adding item labels." Before the days of fast Internet access, physical strategy guides often accompanied role-playing games. These guides would essentially work as a walk-through, having pages dedicated to each area of the game. While this map doesn't include Pokemon spawn locations, it does basically provide an entire strategy guide all in one image. The detail and dimensions of the image result in the file being over 11mb big. This might not seem huge by today's standards but when you consider a Pokemon Red or Blue ROM is less than 1mb in size, it shows how comprehensive it is. Read More: What are the best selling Pokemon games of all time? Moreover, it shows just how incredible it is that one of the most popular games (and best selling) can be under 1mb in size.